Born in 1984, Winston got his start by tattling on his older brothers and sisters. When he was in school his principal quickly noticed his turncoat talents, thus naming Winston the O-fish-ial Hall Monitor of C.E. Flounder Elementary. After a brief "peeping tom" phase during puberty Winston went on to college at UC Berkeley where he majored in computer surveillance and minored in French. After college Winston worked as a snoop for House Speaker Nancy Pelosi before joining the Obama campaign in 2008. 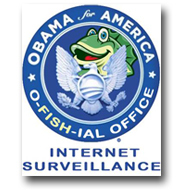 He is now the director of the White House's O-fish-ial Office of Internet Surveillance. Check out Winston's blog post!